The ‘Daily News’ brought out its biggest ever headline on March 12th 1990 to report the shortest ever cabinet meeting. Ministers arrived in their cars and, according to a report in Dar es Salaam’s ‘Business Times’, expected to be there for perhaps three hours. Many instructed their drivers to leave and come back later. But the meeting lasted only three minutes. President Mwinyi indicated that he wished all 26 Ministers and 14 Deputy Ministers to resign immediately ! After the short cabinet meeting, in the absence of their cars, several Ministers had to walk home! And one Minister, who had explained that he had an important engagement in Europe in a few days time had been told firmly to cancel it. There followed two days of intense speculation in Dar es Salaam. According to ‘Africa Events’ there was much enthusiasm by the populace and a belief that something was, at last, about to be done about the rampant corruption. But when, two days later, President Mwinuyi announced that he had reappointed Mr Joseph Warioba as Prime Minister, there was profound disappointment. This was not because Mr Warioba was considered to be corrupt but because people thought that this was an opportunity for a clean break with the past and for a new beginning. People had to wait another day before the rest of the new government was announced. President Mwinyi dropped seven ministers. They were, with their old portfolios in brackets, Messrs Al-Noor Kassum (Energy and Minerals), Aaron Chidua (Health), M. Kimario (Home Affairs), D. Lubuva (Justice), C. Kissanji (Water) and A. Ntagazwa (Lands, Natural Resources and Tourism) plus Mrs G. Mongella (Minister without Portfolio). The Ministers, Pres1dent Mwinyi stated categorically, were not guilty of corruption; the fact that they had been removed from the government should not be misconstrued either by the public or the individuals themselves. All the seven were “nice, decent, and clean people, but this move is being taken because a lot of evils have been going on in their ministries. It is a question of accountability and nothing else” he said. Such malpractices were widespread throughout the government but they were worst in their ministries.” Actually, they have been let down by their subordinates” he said. The President likened the plight of the ministers to his own problem in 1976 when he had had to resign as Minister for Home Affairs when forces under his ministry had misbehaved in Shinyanga where a number of people had died. “I never sent them there to misbehave, nor did they consult me about it, but then I was accountable” he said. He had realised how wise his predecessor Mwalimu Nyerere had been when he had advised him in 1985 at the time of the handing over of power to be ‘a little bit harsh’. He intended to be very harsh, he said – Daily News. ‘Africa Events’ in its April 1990 issue endeavoured to work out the deeper reasons behind the dramatic reshuffle. It stated that the CCM Party’s National Executive Committee had had before it at its meeting (February 7-12) the report of the ‘Committee of Enquiry into Corruption’ which had been set up two years earlier. The report had made extremely grim reading. 12 institutions including the Ministries of Health, Home Affairs, Justice and Lands had been highlighted as particularly notorious. Chairman Nyerere was said to have demanded that the ministers responsible should appear before the Central Committee of the Party. The Minister of Justice was said to have immediately submitted his resignation rather than accept what he regarded as undeserved humiliation. Apparently the Prime Minister had done likewise. However. the Minister for Home Affairs had been prepared to face the Central Committee but had indicated that what he would say would embarrass everybody. It was to avoid resignations and embarrassment that the decision to call on all to resign was taken according to ‘Africa Events’. 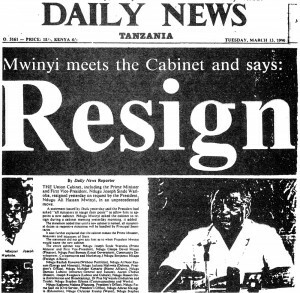 In a separate article in the same issue ‘Africa Events’ noted that when the cabinet was asked to resign Mwalimu Nyerere was several thousand feet up in the air on his way to Rome. When he had been President, Mwalimu had hardly ever sacked anybody. His loyalty to his colleagues was his weak point. Did he know what was going to happen? Apparently, President Mwinyi had gone to the airport to see Mwalimu off for Rome and immediately on his return to State House, he had assembled his ministers and ‘pulled out his long knife’. Again, according to ‘Africa Events’, those who were at Rome’s airport when Mwalimu arrived were under the impression that he had been taken completely by surprise. President Mwinyi had ‘fired his own volley and what a thunderous bang it has been’. ‘He now stands unquestionably tall despite his short physique. Tanzanians looked on in unconcealed joy. Dar es Salaam will never be the same again’ the article concluded. The Ministry of Justice has been abolished but the Minister, Hr Damian Lubuva, retains his post of Attorney-General. Deputy Ministers remain the same except for Mr Rajabo 0 Mbana, the MP for Kigoma Rural, who becomes Deputy Minister for Lands, Natural Resources and Tourism and Mr Evarist Mwananso who moves from the Ministry of Lands to the Ministry of Agriculture and Livestock Development. The President stated that, although people wanted to see change, it would not have been proper to bring in a completely new team with only four months to go before Parliament is dissolved and fresh elections are held in October. If he had done so, the new ministers would still be finding their way around when elections were due. The major tasks of the new cabinet would be to fight corruption vigorously, cut costs and supervise work and I want to see results said President Mwinyi. People must be given loans under laid down procedures. On cost cutting he said that he had already instructed ministers to reduce unnecessary foreign trips and cut down the number of seminars unless they were budgeted for or financed by foreign donors. He was also drastically cutting down diplomatic personnel in foreign missions. Except in a few cases, only a Head of Mission, his immediate assistant and one supporting officer would be posted abroad. In future all ministers must be accountable he said. Supervision at work was a must. Official transport must not be seen to be wandering about after 2.30 pm. President Mwinyi also announced that he would be holding monthly meetings directly with the people. At his first meeting, for which some 600 people registered, and which was held at the Lumumba Party Sub-Head Office in Dar es Salaam, he sat for eight hours listening to complaints centred on unresolved land issues, delays in court cases and the denial of terminal benefits. He immediately ordered the arrest of two Land Officers who were subsequently charged in court with three counts of soliciting and receiving a 280,000/bribe. Other anti-corruption activity on subsequent days included the suspension of Judge Moses J Mwakibete for allegedly receiving a bribe (two of the judges charged with examining the case would come from outside the country), the transfer of the Commissioner and Deputy Commissioner of Customs to other duties and various other minor court cases. In Zanzibar, after President Wakil had met 14 more people out of 300 with complaints, he summoned officials from two ministries, the CCM Party and the Police to comment on the grievances. 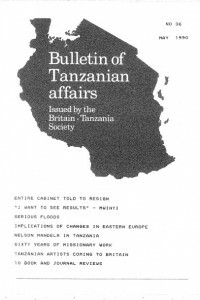 Tanzania is suffering, as this Bulletin goes to press from its worst floods since 1944. President Mwinyi has launched an appeal to international donors for urgent help. More than 100 people have been killed and 1,500 houses have been swept away in the Mtwara and Lindi regions. 300 people have also been made homeless in Babati town. The latest news from the flood zone in southern Tanzania is that victims urgently needed help from the local and international communities including food, medicines, temporary shelter, clothing and cooking utensils. Prime Minister and First Vice-President Warioba, returning from the devastated area, said that the government also needed vessels including helicopters to distribute relief supplies. Most of the affected areas were inaccessible by road. He estimated that Shs 260 million would be needed to rebuild four big bridges washed away or damaged by the floods and many smaller bridges had been affected. More than 72,000 people were homeless in Lindi district. In some cases the midnight floods from the Makonde Plateau had wiped out entire settlements leaving no trace. Twenty houses have also been destroyed in Morogoro region following heavy rains which have fallen all over the country. Tanzania needed friends of the kind found in the Britain Tanzania Society more now than in the past because of the changing climate of opinion in the West about Africa said Mr John Malecela, Tanzania’s new High Commissioner in London speaking on April 11th 1990 at Commonwealth House. He was at a ceremony marking the handing over of a bust of former President Nyerere by the Society to the Commonwealth Trust which will display it on the ground floor of its Northumberland Avenue headquarters. Mr Malecela quoted impressive statistics on advances in education and provision of health care in Tanzania since independence but indicated that from 1976 onwards things had become much more difficult as the Aid community – and particularly the IMF began to attach conditions to its assistance. Adult literacy had fallen from 86% to 76% as Tanzania had been forced to limit its spending on social services. He noted how Malawi had been recommended as an example of what Tanzania should have done. But Malawi was itself now facing very serious problems. Unlike many other developing countries Tanzania had been willing to ‘lift up the carpet and show the dirt underneath’. He expressed concern at current ‘aid fatigue’ in the West and said that Africa wanted non-government organisations like the Britain Tanzania Society to speak out loud to combat the increasing attention being focussed by everyone on Eastern Europe. Eastern Europeans were ten or even a hundred times better off than Africans he said. Asked by a member of the audience whether Tanzania did not need ‘glasnost’ as well as ‘perestroika’ Mr Malecela spoke about multipartyism. Yes, he said, a multi-party system will come to Tanzania. But we should be very cautious. Tanzania had become a one-party state by default not by design. Mr Gorbachev had unleashed forces which threatened to break up the Soviet Union. And we should look at the situation in Yugoslavia. If Tanzania had a multiparty system now ‘people would be bought’. Tanzanians would become items for sale. He referred to Nicaragua and American money and the recent allegation about Mr Scargill and Libya. He pointed to Mwalimu Nyerere’s great achievement in bringing 121 tribes together as Tanzanians. “We should take it easy on the multi-party issue. We might make a terrible mistake”. 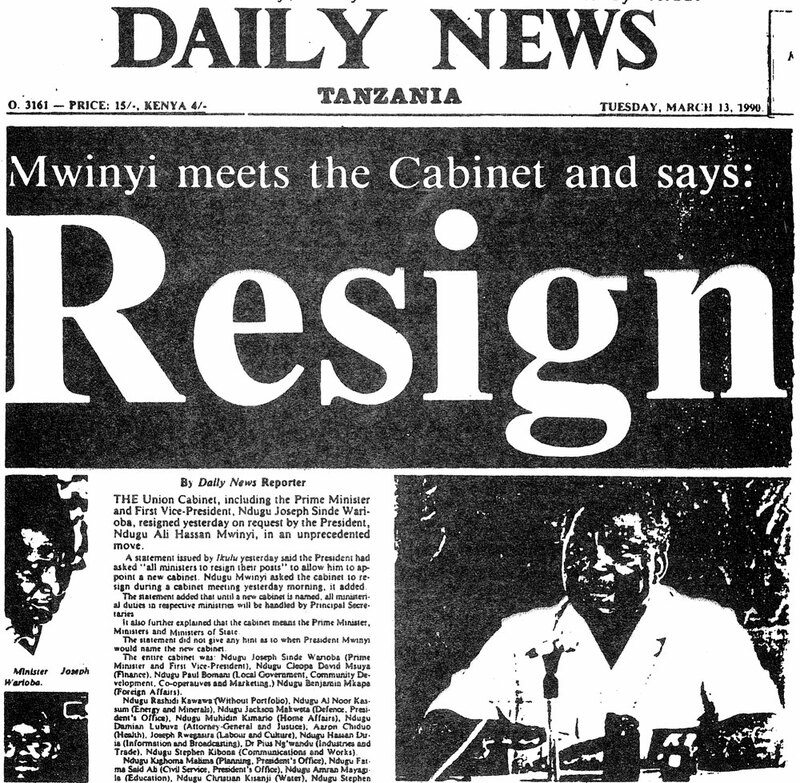 ‘Winds of change have gusted down from Eastern Europe to stir an unprecedented political debate in socialist Tanzania’, wrote the Nairobi Daily News in its April 4th 1990 issue. In an article under the heading ‘Is Tanzania Ready for Multi-Party Democracy’ the paper stated: Mwalimu Nyerere himself opened the debate in February 1990 when he said that Tanzanians should not … believe that a one-party state was God’s wish. “It is now possible to have alternative parties if only to overcome problems related to complacency in a single-party system” he said. Diplomatic sources were quoted as having said that Mwalimu. who had seen much of his economic thinking reversed by the market-oriented policies of his successor, President Mwinyi, was clutching at the last of his ideals. Dr Nyerere was said to have been badly shaken by events in Eastern Europe and to fear that his life’s work might be swept away. The’ New York Times’ in its issue of February 27th under the heading ‘African Elder Trims One Party Stand’ stated that ‘in what amounted to the first discussion by an African leader of the political repercussions of events in Eastern Europe – where Tanzania has sent Party cadres to study – Mr Nyerere had suggested that a single-party state should not be sacrosanct. It was thought that he had been influenced by the visit he had made in January to East Germany where his party had formal relations with the then ruling communist party. Tanzanians training at East German party schools had been sent home after the schools had been closed down. Addressing media representatives in February Mwalimu had also said that it was absurd and ridiculous to suggest that Tanzania’s socialist policies would go with him. Tanzania had a generation of people who valued Ujamaa. “It is not out of vanity that I say this” he said. “Ujamaa has taken root in Tanzania”. If CCM however were to give the green light for the formation of many parties then those parties should be national, secular and socialist in character. On March 24th 1990 a three-day symposium began in Dar es Salaam. The theme was again the changes sweeping Eastern Europe. But, this time, according to the Daily News, there was a consensus, during discussion of a paper analysing global experiences in building socialism, that Tanzania’s political system allowed a great measure of popular participation. Participants felt that Tanzania could be a model of one party democracy. Rather than forming more political parties, Tanzanians should reform the present system to maximise democracy and check corruption of power in high offices. Professor Aikael Kweka of Dar es Salaam University said that the changes in Eastern Europe did not signify the end of socialism. Socialism would remain necessary as long as oppression and exploitation existed. Others felt that the Party had been doing quite well in Tanzania and that only a few small changes were needed. “Socialism is the only pillar, come what may” said one party representative. Then followed a seminar in London, held at the Commonwealth Institute on April 14th 1990. It was a packed occasion of over two hundred Tanzanians from all over the United Kingdom and Ireland. It was chaired – better perhaps to say animated – by Tanzania’s lively new High Commissioner in London, Mr John Malecela, who controlled the discussions with considerable aplomb, a light hand and great wit. The most solid paper was presented by Dr E. J. Kisanga, who, unlike most of the participants, stressed the economic implications and the need for Tanzania to become a viable trading nation. He saw the implications of the changes in Eastern Europe as greater competition for the resources of Western Europe and perhaps more severe conditionalities attached to aid with adverse effects on foreign investment in Tanzania; but, at the same time, possible advantages in the opening up of new markets for Tanzania’s products like tea, coffee and cashew nuts. The world was watching Tanzania he said; they had been able to attract resources in the past because of Tanzania’s good record but there was a risk of the country being marginalised if it did not retain this good record in terms of human rights. Speaker after speaker, including, surprisingly, several members of the staff of the High Commission, called for changes in Tanzania. People wanted to decide for themselves and not to have decisions taken for them. Few speakers however were prepared to be precise about what the changes should be. No one advocated capitalism directly and one fluent lady speaker, defended Tanzania’s present political structures. She said that she had been in the Soviet Union for seven years and that as far as she was concerned Perestroika had failed and it was not needed in Tanzania. But there were still many problems to be resolved at home. Speakers pointed to the important issues involved: private sector versus state sector; collectives and individuals; equity and growth; inheritance and disadvantage; Tanzania’s politicised army; above all, poverty. ‘There is democracy and domocracy’ – from the Swahili word for mouth ‘mdomo’; Tanzanians were said to be very good at ‘domocracy’. ‘The Republic of Kilimanjaro has nothing to do with this seminar’; a reference to a remarkably badly written tract handed to participants outside the building as they arrived; it proposed that if, after a referendum, Zanzibar should break away from the Union, the mainland should be called the ‘Republic of Kilimanjaro’. ‘Most civil servants are thieves’. ‘Remember, a leader is a person whose salary is bigger than his father’s was’. ‘People are dying in various parts of the world because of language and religion; in Tanzania we have a unified democratic state without language and religious problems. ‘The important things are love of people for each other, religion and food to eat’. ‘Will change help the common man? …. if people weren’t greedy everything would be alright’. The debate was lively, good humoured and all spoke sincerely about what they thought. There was no anger. This debate was something which, one speaker pointed out, would not be possible in the case of some of Tanzania’s neighbours. Mr Richard Mpopo and the Tanzania Association deserve considerable credit for organising such an ambitious occasion. Tanzania’s new Investment Code drawn up by the government has finally been agreed after amendments insisted on by the CCM Party designed to stress the motivation of Tanzanians to invest in their own country. At the beginning of April the Investment Code was brought before Parliament under a Bill entitled the National Investment Promotion and Protection Bill. In the debate there were demands for more definitive laws to protect local entrepreneurs from ‘the jaws of international capitalism’, clearer definition of customs policies and land ownership, guarantees on transfer of technology, a removal of red tape, more explanation of what joint ventures meant to Tanzanians and more progress in demarcating village boundaries ‘to protect them from the risk of losing their land to foreign investors’. The Minister for Industries and Trade, Mr Cleopa Msuya said that Tanzanians should change their attitude towards work, raise their productivity and assure foreign investors that they would get their money back. The Bill was subsequently passed unanimously – Daily News. Britain has announced an additional £2.5 million assistance to Tanzania’s Economic Recovery programme. The announcement was made by Mrs Lynda Chalker, Minister for Overseas Development during a dinner on March 5th 1990 hosted by Tanzania’s former Minister of Finance, Mr Cleopa Msuya. The sum is additional to the £15 million pledged by Britain during the consultative group meeting in Paris in December last year. The visiting Minister commended efforts being made by the Tanzanian Government towards economic recovery and pointed to the increase in agricultural and industrial output which had been achieved. The £2.5 million would be used for provision of human drugs and buses for urban transport and was in response to an urgent request from the government. Mrs Chalker visited the Mnazi Mmoja Hospital, the Malawi dry cargo facilities at the Dar es Salaam port and the Kisimbani Clove research Station in Zanzibar. It was in these terms that Mwalimu Nyerere described Nelson Mandela in introductory remarks before Mwalimu presented him to the multitude of people who thronged the National Stadium in Dar es Salaam on March 6th 1990. ‘It beats the mind’, wrote the ‘Daily News’ in its second lavishly illustrated special supplement on the visit, ‘how, after spending 27 years of physical and psychological torture in the jails of currently the most brutal regime in the world, he can still maintain a razorsharp mental alertness and physical fitness’. As early as 10 am, the account continued, although people knew that his plane was not due until 5 pm the road to the airport and the airport itself was beginning to be filled with excited people. Although there was a heavy downpour of rain immediately before his arrival, plus the fact that Dar es Salaam has chronic transport problems, hundreds of thousands of people stayed along the route to give Mr Mandela the biggest reception ever seen in Dar es Salaam. Everyone went wild with excitement at seeing the man they had only heard about or seen in pictures. “It is a distant dream come true”, “I cannot believe my eyes”, “This is great”, “I can now die in peace” exclaimed people as they saw Nelson Mandela and his beautiful wife Winnie triumphantly pass by in the ceremonial Rolls Royce with a beaming Mwalimu at his side. Mwalimu was visibly a proud man because Tanzanians, were once again demonstrating their political maturity, for, as he once said, Tanzanians can tell a comrade from a friend. The 100,000 plus mass of people in the National Stadium on March 7th heard Mr Mandela speak. Although old, his voice was still strong and forceful, his reasoning disarming. Mr Mandela was awarded the ‘Order of the Torch of Kilimanjaro of the Second Class’ which is normally presented to Prime Ministers and other leaders of great distinction and eminence. For four hours the following day normal business in Zanzibar town was paralysed as thousands of islanders poured into the streets, jammed the airport and the Amaan Stadium to welcome ‘Comrade’ (as he was described throughout his visit) Mandela. ‘Amandla’ the capacity crowd roared as the open Landrover drove round the stadium. Mr Mandela recounted his encounter with the late Isles President, Abeid Karume, in Addis Ababa in 1962. Mr Mandela requested to be taken to Mr Karume’s grave and he was shown the place where Mr Karume had been assassinated. Mr Mandela, who had last visited Tanzania shortly after independence in 1962, spoke highly of the Union between the former Tanganyika and Zanzibar and said that other African leaders searching for the unity of the continent should study the Tanzanian formula. By this time the visitor was enjoying himself so much that he said to the delighted crowd that he contemplated sending Winnie back to Soweto so that he could enjoy Tanzanian hospitality more freely. There was a brief session of Parliament in April 1990 to deal, amongst other things, with the new Investment Code. Mr Benjamin Mkapa, Foreign Minister announced that his 1989 foreign development projects had been completed. The High Commissioner’s House in London had been repaired (Shs 2 million), the Embassy building in Beijing had been purchased (Shs 66 million), and a house had been built for the Ambassador in Rome (Shs 40 million). Only half of the OAU’s members had contributed to the organisation’s regular budget for the period between 1975 and 1988. Tanzania had paid its dues. The Deputy Minister for Home Affairs announced that the government planned to issue identity cards to all residents in Tanzania. Funds for the manufacture of the cards were now being sought. The Deputy Minister for Defence and National Service revealed 1n answer to question that there were at present 67 Second World War veterans receiving pensions from Britain. The payments ranged from Shs 400 to Shs 4,400 per month depending on health status and disability. In 1962 some 5,000 soldiers had been receiving Shs 50 a year from Germany for service in the First World War but it was now difficult to obtain accurate records to support additional claims for compensation for war service. A number of MP’s called for a total review of the Cooperative Law. “Peasants have no say over who to cooperate with” said the Member for Musoma Rural. Other members claimed that the government did not have a consistent policy on cooperatives and that it was directly interfering in the running of cooperative unions. The government was proposing the setting up of a new Apex organisation for the cooperative movement. The government also presented a Bill to Parliament to amend several provisions of laws that established crop marketing boards for cotton, coffee, tobacco and cashew nuts. The Boards will be turned into agents of cooperative unions. The government also introduced an amendment to the Rent Restriction Act of 1984 to remove provisions that required landlords in commercial premises to look for alternative accommodation for tenants where the landlord wished to repossess his property for his own use. In the March session of the Zanzibar House of Representatives the Member for Magomeni, Colonel Mussa Ameir, complained about the way in which the Isles’ legislature was represented at meetings of the Commonwealth Parliamentary Association saying that, in most cases, the invitations were sent to the Union Parliament which was then at liberty to include or exclude Zanzibar representatives. “We demand direct invitation because the two legislatures have equal status’ he said. Tanzania’s immunisation coverage of one-year-old-children (85%) is one of the best in Africa according to the ‘State of the World’s Children 1990 Report’ issued by UNICEF, Dar es Salaam. ‘Coverage’ refers to immunisation against the major killer diseases – diptheria, whooping cough and tetanus. Seychelles leads with 94% followed by Cape Verde 90%, Botswana 89% and Mauritius 87% Tanzania comes next, ahead of 40 other African countries – Daily News. Tanzania’s ‘Gold of the Forest’, the African Blackwood (Dalbergia melanoxylon), known locally as ‘Mpingo’ is being threatened by over-exploitation, bushfires and human activities. The wood is in great demand for Makonde carvings and, in Europe and the USA, for musical instrument billets. It is estimated that there are 134,000 square kilometres of forest in the Lindi and Mtwara regions, parts of Handeni district and in the Coast and Morogoro regions. But recent estimates on an area of 4,088 hectares indicate that there are only about 12 stems of Blackwood per hectare. Furthermore, the growth rate of the tree is very slow – it matures in about 100 years – and most of the trees are in bad form so that recovery rate of the best wood is only about 25% at the sawmill. As the machinery in use at the mills – at Mingoya, Kilwa Masoko and Lindi can process only larger pieces of wood, smaller pieces tend to be thrown away. SHIHATA (the Tanzanian News Agency) has reported (March 5 1990) that President Mwinyi has visited the AIDS ravaged Kagera Region where there are now 7,000 orphans whose parents have died of AIDS. The President hugged some orphans in the worst hit Muleba district and, when he concluded his visit, he informed his wife, Mama Sitti, that he was taking back to Dar es Salaam two orphans for adoption. He asked other people to do the same. 3,500 of the orphans are below nine years old. But, as Dr George Lwlhula, who has done research in the area says, the problem is that not many people are willing to adopt or take care of the orphans. The authorities have therefore launched a fund to build them a home and send them to school. France and Denmark are providing aid. Another problem that has recently come to light is the refusal of many civil servants to accept transfer to Kageraj a number of others have requested transfers away because of fear of the disease – Daily News. in March 400 acres were planted in the Mbulu, Babati and Hanang districts. It was hoped to plant a further 4-00 acres by July 1990 and 1,500 acres by May 1991. Tanzania’s once thriving pyrethrum industry yielded 6,000 tons in 1967 but by 1988 production had dropped to 1,400 tons the bulk being produced in the Southern Highlands. The drastic fall has been attributed to competition from synthetic pyrethroids in the industrialised world but opinions were now changing as the pyrethroids were proving dangerous to the environment. Tanzania’s Pyrethrum Board has been able to raise prices from Shs 47.80 in 1988 to Shs 60 in 1990 as world prices have improved. The Board also supplies free seeds for nurseries. It is hoped to increase production to 2,200 tons by 1991/92 said a Board representative. Tanzania has a new tabloid newspaper. It is called the ‘Family Mirror’ and its first issue is dated April 1990. Its main front page article is headlined ‘Minister Threatens to Shoot Potential Opponent’ and starts: ‘A Senior Minister who survived the recent Cabinet shake-up has threatened to gun down a distant relative after jujumen warned him that the relative would cause his political downfall ….. The Bank of Tanzania (BOT) has taken over responsibility for the export of gold and is offering attractive and competitive prices so as to better control the industry and ensure that Tanzania obtains full benefit from gold sales. It has been estimated that as much as one and a half tons of gold is being smuggled out of the country every month through the borders and communication and transport outlets. The Gold Committee of the Federation of Miners Associations of Tanzania (FEMATA) has welcomed the decision and has suggested the establishment of an international auction floor in Dar es Salaam to maximise profit for the country. The committee has also suggested that gold should be locally refined 99% before it is exported. Several goldsmiths have said that they will cooperate with the government and banks to ensure the success of the new arrangements – Daily News. Sixteen prisoners died of various diseases caused mainly by overcrowding at Ukonga and Keko remand prisons between January and March 1990 the Commissioner of Prisons has announced. Seven of t deaths were caused by AIDS. Keko Prison has a capacity for 340 prisoners but is at present holding 1,700 prisoners. The Commissioner also revealed that two prisoners had escaped from Uyui Prison in Tabora in January because of negligence on the part of prison officers. They were still at large. A new prison with a capacity of 600 is expected to open in June 1990 and should relieve overcrowding. The Commissioner denied reports that some prisoners were suffering from malnutrition. Some 12 Tanzanian musicians and dancers (including an 80 year-old singer! ), an artist and a painter were expected to arrive in Britain at the beginning of May to perform at various sites in the country including the Museum in Glasgow, and the Africa Centre and Commonwealth Institute in London. Ms Fatima Abdullah, the Minister Counsellor (Culture and Information) in the Tanzania High Commissioner told the Bulletin that the visitors will include Taraab musicians and dancers from Zanzibar (Taraab music is unique and combines African, Asian and Arab elements), Mr Kavanga Abdurahman with ‘Tingatinga’ paintings (this style of art was originally designed by a Makonde artist named Edward Tingatinga and features free-hand, always curved, never straight, brightly coloured images of birds, trees and animals with the dot as a recurring motif) and Mr Freddie Macha from Moshi who will present poetry using a guitar and drums. The Sugar Development Corporation (SUDECO) estimates that it will need some Shs 30 billion to revamp the Kagera and three other Tanzanian sugar mills. The Kagera plant was first commissioned in 1982 but its operations were bogged down by management conflicts. It has the capacity to process some 60,000 tons of sugar anuually but the highest production reached so far has been only 6,000 tons. Total production of sugar in Tanzania was estimated at 94,000 tons this year compared with a national demand for 450,000 tons. Efforts are under way to raise the necessary funds from British, Dutch and Tanzanian resources – Sunday News. The ‘Independent’ and the’ Times’ carried obituaries in January 1990 on the late Sir Hugh Elliott Bt who has died, after a long illness, at the age of 76. He first entered the Colonial Service in Tanganyika in 1937. He made one of his most important contributions to wildlife conservation in Tanganyika in 1956 when, as Permanent Secretary of the Ministry of Natural Resources, he greatly facilitated the work of Professor W. H. Pearsall, whom the Fauna Preservation Society had sent out to conduct an ecological survey of the Serengeti National Park. The Pearsall Report saved parts of the park from agricultural development. The ‘Independent’ wrote that it was not too much to say that it was largely due to Elliott’s behind the scenes influence at that time that present-day Tanzania owed the preservation in pristine condition of its two greatest tourist assets, the Serengeti National Park and the Ngorongoro Crater. Sir Hugh, who was described as quiet, humorous, and sympathetic, subsequently worked in the International Union for the Conservation of Nature. He was a well-known ornithologist. He is survived by his wife Elizabeth with whom he was able to celebrate his golden wedding only a few days before his death and by their son, the ornithologist Dr Clive Elliott and two daughters.